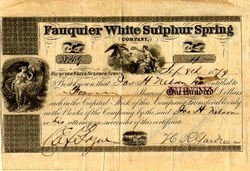 Beautifully engraved certificate from the Fauquier White Sulphur Spring Company issued in 1879. This historic document was printed by Rawdon,Wright & Hatch and has an ornate border around it with a vignette of an a partially clothed woman and an eagle. This item has the signatures of the Company's President and Secretary and is over 134 years old. FAUQUIER, a county in the north-eastern part of Virginia, has an area of about 680 square miles. It is bounded on the S.W. by the Rappahannock, and its branch, the North river, and drained by Goose creek. The Blue Ridge extends along the N. W. border; the surface is finely diversified, and the soil is mostly very fertile. Wheat, Indian corn, and grass are the staples. In 1850 this county produced 386,324 bushels of wheat; 562,959 of Indian corn; 8523 tons of hay, 72,825 pounds of wool, and 210,711 pounds of butter. There were 17 flour mills, 5 grist and plaster mills, 8 saw mills, 7 tanneries, and 1 woollen factory. It contained 35 churches, 2 newspaper offices; 601 pupils attending public schools, and 322 attending academies and other schools. Several gold mines have been worked in the county. It also contains valuable beds of [p.376] magnesia and soapstone. The Rappahannock is navigable by small boats. The county is traversed by the Orange and Alexandria railroad, and by the Manassa's Gap railroad. The illustrious John Marshall, chief-justice of the United States, was born in this county. Formed in 1759, and named in honor of Francis Fauquier, at that time governor of Virginia. Capital, Warrenton. Population, 20,868, of whom 10,518 were free, and 10,350, slaves. FAUQUIER WHITE SULPHUR SPRINGS, a post-village of Fauquier county, Virginia, on the Rappahannock river, 57 miles W.S.W. from Washington, is a beautiful and popular place of resort in summer. In the mid 1830's, with its long history of acclaim for the waters, two large hotels and a number of cottages were built to accommodate nearly a thousand guests. The spa was solace to many renown guests, including Presidents Madison and Monroe who owned cottages, in addition to Chief Justice John Marshall, President Martin Van Buren, and Mrs. Henry Clay who all visited The Springs. In 1849, the Virginia Legislature moved "bag and baggage" to The Springs during the cholera epidemic in Richmond. Famous Confederate cavalrymen, such as Turner Ashby and Colonel John S. Mosby, as well as Justice Taney of Maryland were often at The Springs that summer. The Springs was in full tide of prosperity, noted at home and abroad. It was famous as one of the most elegant and popular watering resorts in the south, drawing guests from all over the country, but especially from Virginia, Washington and Maryland. In 1862, at the onset of the Civil War, The Springs was the scene of a fierce battle for possession of the bridge which spans the Rappahanock River less than a quarter mile away. During the battle, the two hotels and many of the cottages were burned to the ground. To this day, it has never been settled as to whether the Confederate or Union forces were responsible for the destruction. After the war, The Springs became popular once again as a resort, but its old magnificence and glory were never fully resorted. Purchased in 1934, by Walter P. Chrysler, a great deal of restoration was undertaken. The Warrenton House and an old tavern were beautifully restored. The Old Stable was rebuilt to accommodate dances, Hunt breakfasts, and other entertainments. As many as ten other buildings were restored in part to their former beauty.